Interrupted and Delayed Care in First Nation Patients with Rheumatoid Arthritis: The Best Target for Therapy? Background/Purpose: Severe disease and poor outcomes have been described in First Nation (FN) patients with Rheumatoid Arthritis (RA). We examined the contributions of interrupted and delayed care to the outcomes of FN RA patients compared with Caucasian (CA) patients with RA. Methods: Our academic Arthritis Centre maintains a prospective database on all patients seen since 1990, with records of more than 10,000 patients. The database includes patients’ diagnoses, demographics, year of disease onset, and date of first and subsequent clinic visits, and self-reported ethnicity. At each visit, patients complete a modified health assessment score (mHAQ), disease activity visual analogue scales (VAS), while physicians complete joint counts, physician global VAS, and current treatment information. A Lansbury Index (LBI), a weighted joint count, is calculated each visit. After excluding patients if disease duration was >15 or <1 year, or if there were <2 clinic visits, records of the most recently assessed 150 FN and 150 CA RA patients were abstracted. The database was supplemented with search of the provincial electronic imaging and laboratory databases for each patient, to determine serology, acute phase reactants, and radiologic damage or documented joint deformities. Results: Records of 154 CA and 150 FN patients were abstracted. Disease duration and gender distribution were similar in CA compared to FN (9 ±4 vs 8 ±5 years; and 79% vs. 85% female respectively). Mean distance from care was 73 km for CA and 408 km for FN, with 35% of FN living >500 km away compared to 1% of CA, (p <0.001). FN patients were younger at disease onset than CA, (40 ±13 vs 49 ±17 years; p < 0.001). 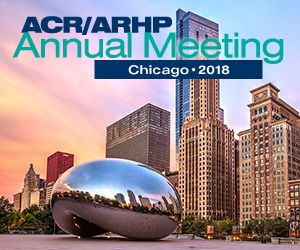 At clinical presentation, FN were more likely to be seropositive for both RF and ACPA compared to CA, (59% vs 46%; p = 0.02) and had higher RF titers (405 ±551 vs 236 ±485; p = 0.005), and ACPA titres (114 ±88 vs 68 ±82; p < 0.001) The two groups did not differ in mHAQ, ESR, CRP, VAS, tender, or swollen joint counts at first visit, but FN had higher LBI scores (40 ±36 vs 28 ±33; p = 0.012). FN had greater delays from symptom onset to first DMARD (19 months ±26 vs 15 ±35; p = 0.2), and first biologic (57 months ±34 vs 46 45; p = 0.06), but had more total DMARD trials over their disease course (5.1 ±3.2 vs 3.7 ±2.5; p = <0.001), and were off DMARD therapy for longer periods in total (36 months ±30 vs 25 ±40; p = 0.009), had fewer clinic visits/year (5 ±12 vs 3 ±7; p = 0.072, and received more frequent intramuscular steroid injections (IMS) for flares: 21% of FN had received 3-5 IMS vs. 12% of CA, and 11% had received ≥ 6 IMS vs 3% of CA; p<0.001. At the last visit, FN had higher mHAQ scores (.71 ±.47 vs .42 ±.52; p <0.001), higher LBI (34 ±37 vs 20 ±30; p = 0.003), and more frequent joint damage/deformity, (85% vs 74%; p = 0.02). Conclusion: The younger onset age, more frequent seropositivity, and higher LBI suggest biologically more severe disease, but our data suggests differential care delivery with modifiable factors over the disease course that likely impact outcomes, including treatment delays, missed appointments, and interrupted treatment. Improved care delivery models, particularly incorporating outreach care, have the potential to improve outcomes substantially for this population.